One of the best ways to make your out-of-town guests feel special is a wedding welcome letter included in your wedding welcome gifts. The purpose of a welcome letter is to guide your guests around unfamiliar territory (especially if you are having a destination wedding!) and, most importantly, inform them of your wedding day or weekend schedule. Wedding welcome letters can also offer a sneak peak into the design and overall feel of your special day. Write a gracious and heartfelt note to your guests. Convey your thanks for making the trip to celebrate this momentous occasion. While most all of your guests know you well and are familiar with your love story, there may be "plus ones" who don't know you quite as well. You might reference a special detail or two about how you met or why your wedding location has special significance to you and your relationship. One of the most common items to include in a welcome wedding letter is the itinerary for the wedding day or weekend. Make sure to clearly state the event, name of the location, address, time, and most helpful, attire. I can’t tell you how helpful it is to include suggestions on what to wear!! Bus pick-up times and locations! This is SO important. I've heard horror stories of guests not knowing where or when to be picked up. Like the wedding itinerary, clearly state the pick-up location and time. If you're not offering group transportation, phone numbers to local, reputable cab companies is always helpful. And, of course, remind them about Uber if offered in your area. This part can be a lot of fun! In your 'What To Do' section, select your favorite places to eat, bars to venture, or local historical museums. This is a great way to share your personal choice of restaurants and hotspots with your guests. Brides, whatever you do, resist the urge to offer your contact information! Take it from me; you WILL be busy. Why add a number at all, you ask? Well, emergencies can happen. Someone gets lost or there are issues with the hotel. While it's not up to you to fix it, it is helpful to provide some form of assistance should questions arise. The best point of contact is your wedding planner or a special person you appoint to handle these types of phone calls. Or, give the assignment to someone not in your wedding party but who is reliable and will know the wedding schedule very well. Anyone but you! Once you have the important content figured out, now you can focus on the aesthetics of the welcome letter. This is the fun part! 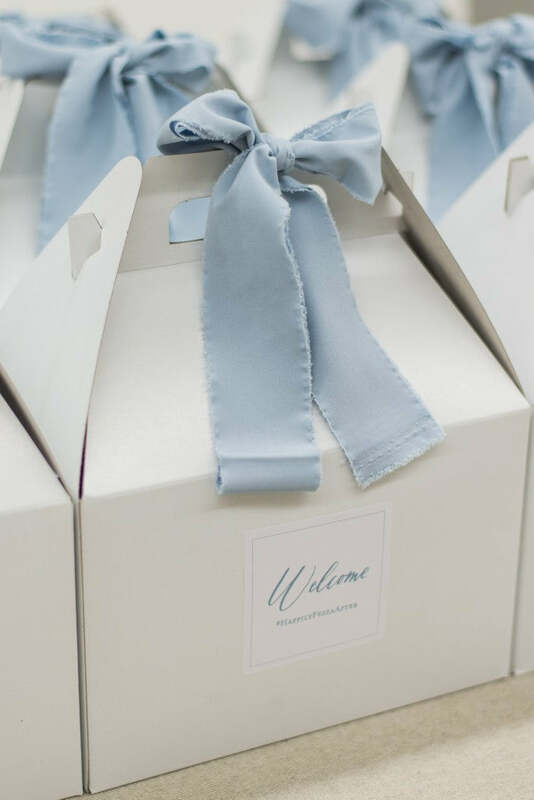 Make sure the design coordinates well with the style and color palette of your welcome gifts. 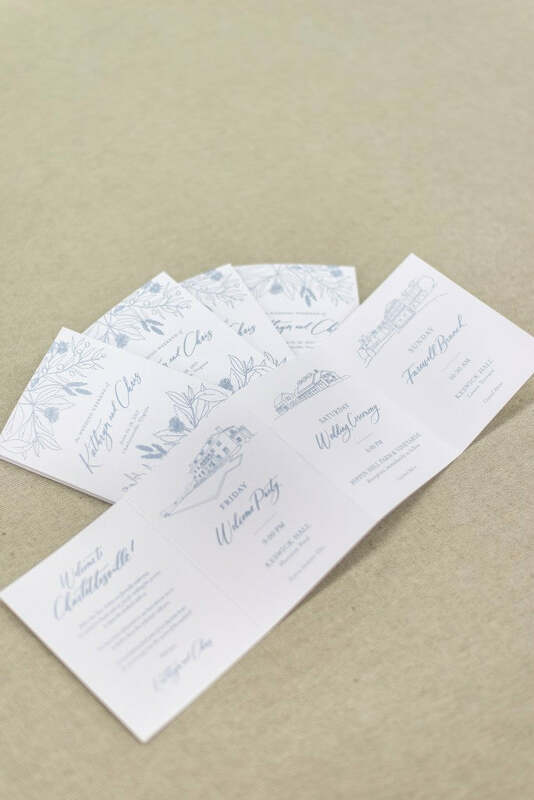 Ideally, your welcome inserts can be designed along with your other wedding paper...invitations, signage, day-of paper, etc. We hope you've enjoyed these tips! If you need more help, reach out to us here. We'd love to learn more about your gifting goals for you wedding...welcome letters included!